I Love school holidays. See that capital L? That's how much I love them. 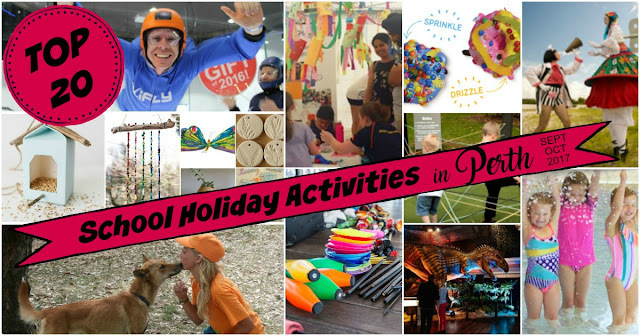 I get a LOT of comments on how fun our school holidays always seem to be, so I figured I would start sharing my top picks so you can hear about them when there is still spots available. Don't get me wrong, my kids fight and send me batshit crazy just like everyone elses kids (please, tell me it's not just me), and there are moments when I can tell you exactly how many hours it is until the next term starts. Every school holidays I plan us one activity a day. It works really well for us because then there is one structured thing and then the kids have loads of free time to just hang out at a park, or play LEGO, and fight with each other. Plus we're not above some serious couch time so we can watch Moana for the 786th time. So here's my top 10 paid activities for us this September/October. Keep scrolling for my top 10 FREEBIES! Your budding engineers will love this one. Using LEGO Technic pieces your kids will be in STEM heaven! Follow it up with some German food and you've got an awesome morning. Absolutely every age kid is covered by this brilliant festival. Tricky is heading to the Junk Shadow Puppet Workshop, and he and Bobbin will be seeing Kaleidoscope, a sensory-sensitive celebration of difference and a look through the eyes of Ethan, a boy with Austism. . There are mud workshops, zombie makeup and film workshops, theatre performances, and dance sessions, plus a chance to meet some amazing performers, authors and illustrators. A fun, creative and extremely yummy activity at the Whitfords and Myaree stores. You get two original doughnuts and a heap of decorations to cover them with. I implement a "mum tax" of one bite per doughnut because DELISH! Children of all ages can run, balance, crawl, climb, carry, lift, and develop new movement skills while improving their risk assessment, team work and problem solving skills. All in an outdoor nature play area! We cannot wait for this one. If life size animatronic dinosaurs are your thing, then this is for you. Step inside a meterorite crater, use augmented reality to interact with dinosaurs and experience the digital dinosaur track. There is also a central play zone and a heap of dino based activities to enjoy. Got a creative kiddo? Rainbow Palette is the place for them. Run by a qualified art teacher, these amazing sessions have limited spaces to ensure everyone gets a lot of time and space to work. The art works being created change every holidays, this time you can choose from wind chimes, plant pendants, bird feeders, planters, looming and even gorgeous Eric Carle inspired butterflies. Plus mum or dad can grab a coffee at Stacked Cafe while they wait. Now this is a big one, but that price represents a whopping 25% saving off the usual $440 package! Up to five people ages 3 and up can experience flight! It is such an amazing experience, MapGuy and I thought it was fantastic and we both highly recommend it - check out the review I did here. Book the Family and Friends package using the code SUPER FAMILY to get the discount. This place is A-maze-ing. See what I did there? Navigate mazes made from tyres, plants, timber and string, and once you've mastered those try a round of mini golf, see the animals, jump on the huuuge jumping pillow, play giant games, and have fun on the playground. Because the weather is warming up Outback Splash will be open too! That means three stories of water playground with six slides will be open to cool you down. If you're feeling brave try the seven metre drop of The Plummet water slide... if you're in to more sedate things, Octopus Bay is for littlies and their carers. The Adventure World season starts the day after school finishes. A Perth staple, this place has been going for years and is the place to go for rollercoasters, rides, swimming and slides. It's definitely on the expensive side, and so is the food, so if you're going, save up and take a picnic lunch with you. We adore Peel Zoo. It is nothing like Perth Zoo (which we also love) and is much more focused on native animals and being able to get close. The Zookeeper for a day program is the shiz. You get to do all the behind the scenes stuff like feeding the animals - even the baby animals OMG. Included in the price is a tshirt, cap, lunch and a certificate that says how rad you are. Experience the magic of the circus with juggling, unicycle riding and circus skills workshops, stage shows, craft stations and game zones. Plus no carnival would be complete without a bouncy castle, face painting, balloon twisters and stilt walkers! Stop motion animation using LEGO for 7-15 year olds. I may try to pass myself off as a 15 year old for this. I can't wait to see what gets created. The Cultural Centre will come alive with all things fun, educational, arty and silly. I have my eye on the Cardboard Challenge, the launch of Dame Lynley Dodd's latest Scarface Claw book (swoon! ), Madame Lark with her musical saw, and the Pop Up Play space. 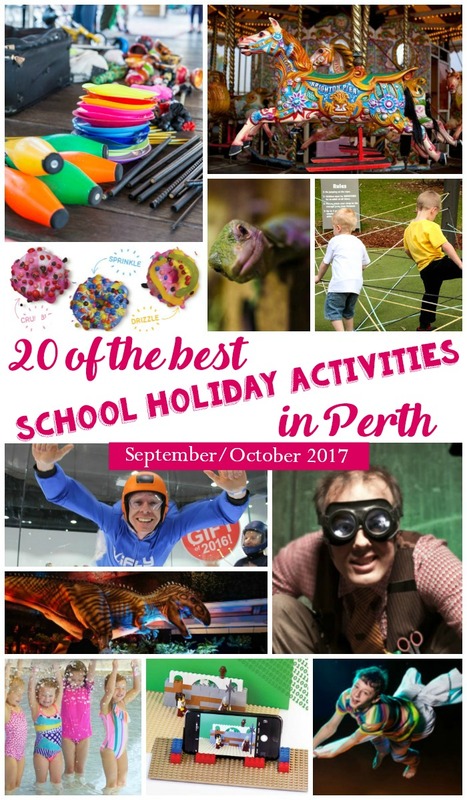 Check out all things scaly and slimy with Critters Up Close (17th Sept), the gigantic 12 metre walk in Giant Kaleidoscope (15 Sept - 13 Oct), the Kids Carnival (16/17 Sept & 21/22 Oct) will have rides, activities and games for kids of all ages, or set them loose with Laser Tag (16/17/23/24/30 Sept & 1 Oct). The Cabinet of Curiosity will let you experience the Nyoongar language and extraordinary objects, check out Bones! Bones! Bones! (three exclamation, it must be good) and learn about bones (surprise), and have a look at the Toy Box while you're there to see toys from all around the world. OMG remember these?! Shrinky Dinks were all the rage when I was at primary school and they're getting a 2017 twist with emoji shapes. Make a charm and turn it in to a keyring or necklace. While you're there check out the Muddle Maze and enter the competition to win a cool prize. This place is one of our regular haunts. Swim in the sheltered waters or run amok on the shaded playground right on the beach sand. There is always a free kids train running during the school holidays, and some days you'll find face painting and other pop up activities. No day is complete without an icecream and at last count there were five dedicated icecream shops! The Great Escape has closed down, but there is still a great day to be had. Just 20 minutes from Mandurah is this insane farm themed playground. Climb over tractors and tyres then head up the windmill and down the slide. Swings galore, a 35 metre flying fox, plus water areas for wading and splashing so bring spare clothes. There are BBQ facilities and toilets, so you could spend hours there without breaking the budget. Shepherd's Bush Reserve in Kingsley is so freakin' cute with mini roads, stop signs, roundabouts, even parking and refueling stations, and is perfect for little ones on scooters, trikes, push-alongs, and small bikes. The bigger kids (or daredevils like Bobbin who has ruled this place since it opened) can get their kicks on the BMX track. There is also shaded seating, BBQs, and a playground. But be warned, there are no toilets! Bunnings always offers up free workshops every weekend, but they step it up on the holidays and most stores tend to have one activity per day. Tricks and Bobbin are signed up for planting and army tank making, but check your local for details. They tend to overbook these things, so be prepared for it to be chockas. Still lots of fun though! No more knock, knock, who's there! 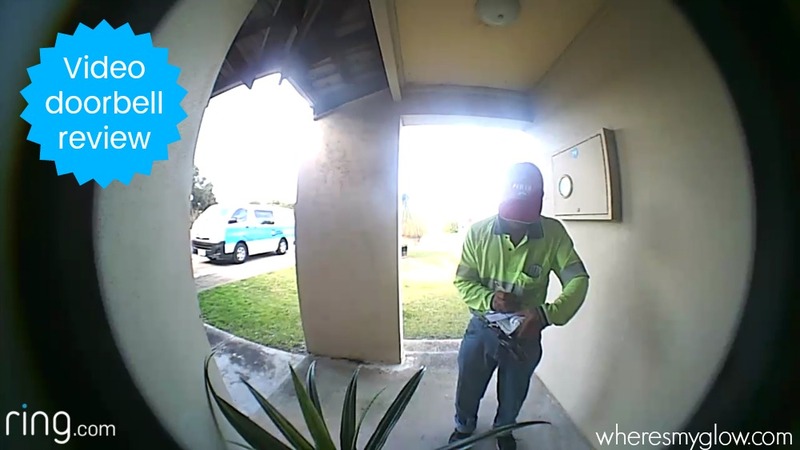 This is a S3 post: I received a complimentary Ring doorbell. It's no secret that I live in a bit of a dodgy area. It's more likely to be mentioned in the news for a stabbing than for the accomplishments of its schools. But as high as it is on the crime-o-meter (that's a thing, right? ), I still love my lil house and this street. It just means we take a few extra security measures. The latest we've adopted is the Ring video doorbell which I had been eyeing off in the catalogues for a while. I thought it would be pretty good, which is why I said yes to a review, but it has actually been even better than predicted, and in unexpected ways! Well, it's a doorbell that has a camera and microphone inbuilt. When someone presses the button you get the usual ding-dong of a standard bell, but you also get an alert immediately via the app on your Android or Apple phone - open it and voila, you can see and hear who is at your door, and they can hear you, but can't see you (or your pyjamas). You can also set it up to record whenever it senses movement so it becomes a security camera even when noone presses the bell. 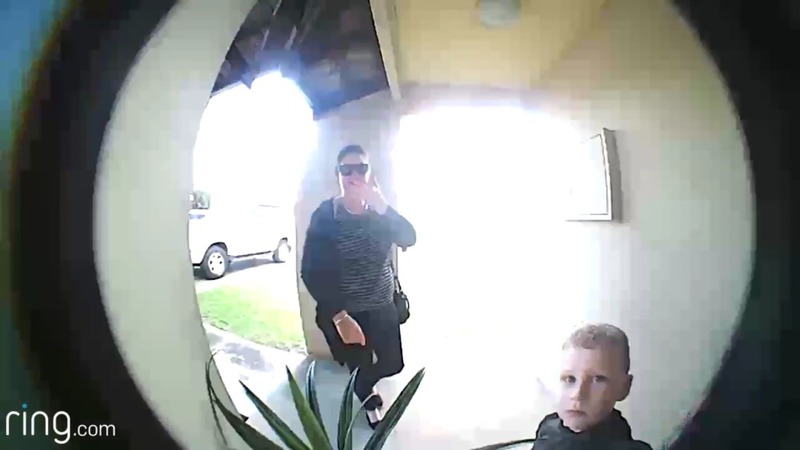 Super handy when you're going away and want to keep an eye on your property or, if you do happen to be broken in to, you might actually catch the bugger on video! Alternatively you might just get cool vision of a child patting a dog and go viral. Whatever works for you. It's quite sensitive so I'll reserve the motion sensor function for when we're on holidays. A great bonus is that you can have it professionally wired to your house, but you don't have to., The internal battery lasts for months and the app actually lets you know how much battery life is left. If you have it turning on all the time with the security sensor, then you might want to think about putting it on the mains, but as a standard video door bell, it hasn't used much of the juice at all. Ours is still running on battery and won't need to be charged for another month or so yet. 1. Because you can see who it is before you press the answer button, you can choose to not answer. Pretend you're not home if it is someone trying to force their religion down your throat, sell you encyclopedias, or even a family member, up to you. You'll never have to close the door on Aunt Beryl again, because you never have to open it in the first place. Aunt Beryl aside, this is also fabulous for those of us with anxiety who are flooded with a sense of dread whenever the bell rings, not knowing who it is. When you see it's a friend with a box of chocolates, you know to let them in. 2. As the app works wherever you have coverage, I answered the door when I was in Kmart the other day and ACCEPTED A PARCEL! Oh lordy, is there anything worse than finding you've been carded two minutes before you got home? I was able to tell the delivery dude that I couldn't come to the door, but he could leave the parcel. I may have looked like a tool in Kmart, but that's OK, I'm used to that. I could have been on the other side of the door with an infectious illness for all he knew, but no, I was looking at storage solutions. 3, Again, because it is app based and you don't have to be on the other side of the door to use it, I was able to let a friend know I was only a few minutes away when she got to my house before me. I'd popped to the shops for milk thinking I could get back before our visitors arrived, but she was early. Rather than her standing around waiting and repeatedly knocking or having to phone me, straight away she knew I was five minutes away. Only once did the video get a bit laggy, making the image pixelated (see above) and the audio was crackly, but on further investigation it appeared to be because we were maxing out the wifi with streaming and downloading at the same time. But even with it coming through at a lower quality, I could still see who it was and hear everything that was said. However, there is one thing I'd like to change if I could. The time it takes for the app to load when the doorbell is pressed. It seems really slooooow. I feel some people might walk away before I've even had the chance to see who it is. The app is 'asleep' to save battery power, and if someone was in a hurry or a courier was ready to card, I reckon you'd end up seeing them getting back in to their van rather than waiting at your door by the time it was up and going. Overall, I'm quite happy with the Ring. 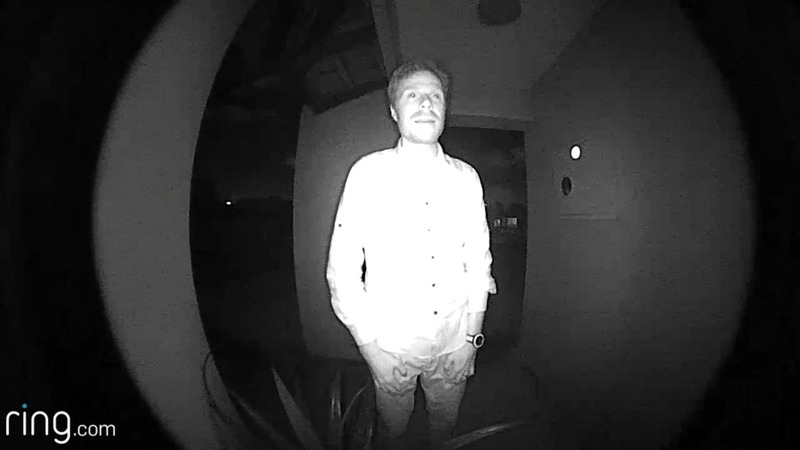 The camera gives a sharp picture, even at night with no external light source (see below), the audio is clear, and the app is very easy to navigate and control. You do have to purchase a subscription to view saved videos (including missed rings), but at $4 per month, that's less than a cup of English Breakfast at the local cafe, so that's OK by me. 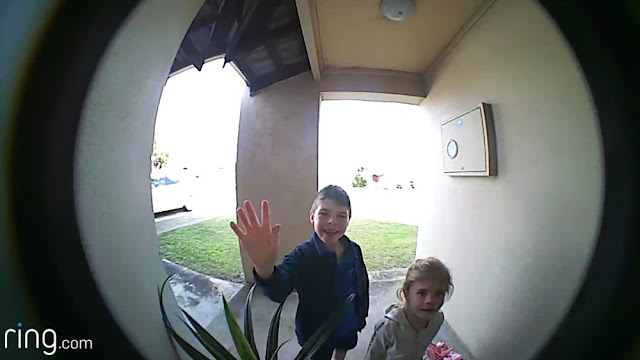 The Ring video doorbell is available from stores such as Bunnings, Harvey Norman, and JB Hi-Fi.